In celebration of Memorial Day, I picked out some cute red, white and blue items. How cute is that red gingham top? These really cute fringed sandals. This classic white blazer that is $50 off with sales. This great summer cardigan that is on sale with additional money off. This dainty necklace perfect to wear with a v-neck tee is under $20. This classic little black dress that is under $30. This ruffled wrap dress that is only $13. This summer striped dress is under $30 - with more additional sales. My favorite brand of tees is 40% off. This cute ruffle trimmed hoodie that is under $30 - and comes in 4 colors. This perfect gingham shirt that is 40% off. This cute gingham swimsuit is 40% off. This tie front tee comes in several colors and is on sale for $12. This classic blouse in a stunning print that is 40% off. This fun scalloped tote is only $50. This cute lace up dress that is 40% off. This is the cutest beach cover up that would also make a great summer dress! 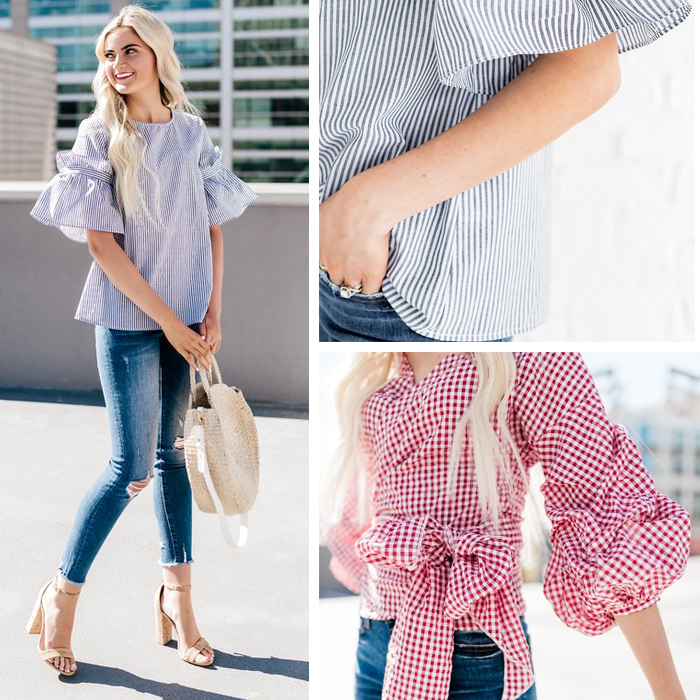 This cold shoulder ruffle blouse for only $13. My favorite designer jeans are 40% off! This cute striped linen jumpsuit that is 40% off. These are the cutest espadrille wedges that are only $33! This pretty floral blouse with flounced sleeves is on sale for $15. I shared more great deals HERE and HERE. Love that red gingham top - Target has one similar and It's just perfect for all the summer parties! I am so behind on the gingham train!